We manufacture an exclusive range of Motor Controller & Contractor. We follow international quality standard norms and are available in customized options also. These are fabricated using high grade material and by means of advanced technology. With the help of our experts, these are designed as per the international standards in order to provide a higher degree of satisfaction to our clients. Curtis invented the world's first practical MOSFET series motor controller in the 1980's. Millions of untis are in use in worldwide, for every imaginable application. Today, Curtis Series Controllers are available in a wide range of models, from simple analog controllers to sophisticated, microprocessor based controllers with Canbus communications and comprehensive diagnostics. Simple, tough and easy to troubleshoot, Curtis series controllers offer excellent value for many applications and markets. 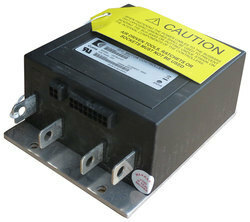 Looking for Motor Controller ?